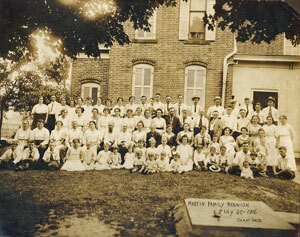 This photograph was given to the Genealogy Center of the Allen County Public Library without caption or other descriptive data. Steve Weaver, eldest grandson of Margaret Jesse Martin, has worked with members of the Martin family to identify the people in this photograph. Click here for a larger version of the photograph and a listing of those who are in it. Mr. and Mrs. Chas. LaCroix, Mr. and Mrs. F. J. Lourent, J. M. Bricker, Mrs. Julian Martin, Mr. and Mrs. Frank Martin, Rev. Father Joseph Lynn, Mr. and Mrs. C.F. Martin, Platsmouth; Wm. Martin, George Martin, Mr. and Mrs. A. C. Roy, Ruth Roy, Alton Bauman, Mrs. And Mrs. William Bauman, Evelyn Bauman, Joseph C. Martin, Mr. and Mrs. Wm. Faulkner, Willard Faulkner, C. P. Roy, Mr. and Mrs. E. V. Gushman, Mr. and Mrs. Henry Martin, Mr. Delphos Martin, Mrs. Delphos Martin, Mrs. Mary LeCroix, Mrs. Julian Martin, Mr. and Mrs. Chas. Graber, Archbold, O.; Bernadine Graber, Marcellus Graber, Virgil Graber, Mr. and Mrs. Harry Bricker, Jack Bricker, Mrs. George Hardesty, Mr. and Mrs. August Guillaume, LaVerne Guillaume, Mr. and Mrs. A. J. Nomina, Martin Nomina, Julian Nomina, Charles Martin, Hazel Carl, Dorothy Faulkner, Mildred Martin, Gladys Martin, Edna Schrader, Maurice Schrader, John Schrader, Mr. and Mrs. William Blume, Virginia Blume, Elmer Martin Blume, Marie Bricker, Frank Schrader, Alfred Sordelet, Benny Martin, Leonard Boaby, John Gillie, Mrs. John Gillie, Richard Gillie, Virginia Gillie, Eugene Martin, Frances Martin; Mr. and Mrs. Clarence Martin, Mrs. Chas. P. Roy, Mrs. Joseph Martin, Mrs. Wm. Martin, Mrs. George Martin, Viola Martin, Alice Martin, Mr. A. E. Martin. Mrs. J. M. Bricker, Mr. and Mrs. A. P. Carl, Martin Carl, Walter Schrader, Hubert Sordelet, Mrs. Victor Sordelet, Joseph Boaby, Gerald Martin, Lawrence Mommer, Mr. and Mrs. Hubert Martin, Edna Bricker, Genevieve Gushman, Mr. and Mrs. Leon Martin, Carlton Martin, Rolland Martin, Leslie Martin, Edward Roy, Victor Sordelet, Mr. and Mrs. E. J. Schrader, George Hardisty, Juanita Martin, Hilda Roy, Clara Faulkner, Grace Faulkner, Ethel Faulkner, Myrtle Faulkner, Pauline LaCroix, Delphos Martin, Harry Martin, Billy Martin, Geny Martin, George Martin, Garnet Martin, Maria Martin, Francis Martin, Auldne Martin, Kathryn Martin, Bernice Martin, Beatrice Martin, Alice Martin, Edith Martin, Verda Martin, Crystal Sordelet, Velma Roy, Mabel Roy, Mr. and Mrs. Frank Boaby, Clotilda Boaby, Bernard Boaby, Anna Boaby, Esther Novich, Wanda Carl.